A 30 y o postpartum woman presents with headaches and drowsiness. The maximum intensity projection (MIP) image from coronal two-dimensional time-of-flight MR venogram (2D TOF MRV) the part of superior Sagittal sinus near torcula show poor flow related signals. 1. Superior sagittal sinus thrombosis. Answer: It’s a common finding in 2 D TOF MR Venogram due to inflow artifact, can be passed off as normal. 2 D TIME-OF-FLIGHT : IN-PLANE FLOW ARTIFACTS. 2 D TOF technique of MR Venogram for demonstration of intra cranial venous system without need for any intravenous contrast. The contrast between the vascular lumen and the background is due to entry slice enhancement of blood flow. Because the image is acquired as a stack of individual slices, every slice represents an entry slice for blood flow. This stack of thin images transformed into MIP reconstructions to demonstrate MR Venogram. The advantages to using a 2D TOF technique over 3D TOF is its sensitivity to relatively slow flow and almost unlimited coverage, there are some artifacts that have to be considered as a result of its single plane of acquisition. to the direction of flow. 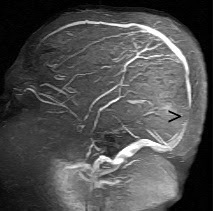 For MR Venogram commonly coronal 2D TOF is used because the venous flow in the brain is largely anterior to posterior. It need to be noticed that the superior sagittal sinus (SSS) is well demonstrated throughout with the exception of the posterior segment at its junction with the straight sinus at the torcula. While this appearance can be readily mistaken for intraluminal thrombus or stenosis, it is important to recognize that this is an artifact of in- plane flow. Since intravascular signal is highest when flow is perpendicular to the slice and lowest when flow is in the same plane as the slice, the signal in the SSS drops off in this vertical segment of the sinus that is in plane on a coronal acquisition. It is important to know how the source data for the 2D TOF study is acquired coronal or sagittal in order to anticipate these artifacts. Acquiring two 2D TOF MRV scans in perpendicular directions or using contrast can help resolve some of the problems created by in-plane flow.